Vedic & Scientific Research Foundation. 11 MANTRAS Sanskrit Words in the form of Code mentioned in Vedic Scriptures. 12 YAJNA/YAGNA The process of offering Herbal ingredients in the Fire along with recitation of Mantras as mentioned in Vedic Scriptures. 13 YAJNA KUNDA A rectangular/Square /Circular/Triangular Structure made of Bricks with certain proportions as mentioned in Vedic Scriptures. 14 MANTRA SASTRA Set of Rules and Regulations for the utilization of Mantras to attain desired result. 15 PUJAS Prayers to seek the blessings of Almighty. 17 JAPA Deep Meditation towards Supreme Reality. 18 PRAYOGA Utilization of Vedic rituals to attain desired result. 25 YANTRA Copper Sheet engraved with certain diagrams as mentioned in Vedic Scriptures. 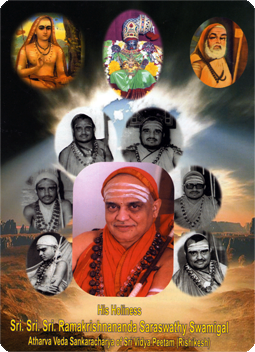 Undertaking the Mission of His Holiness Sri.Sri.Sri.Ramakrishnananda Saraswathy Swamigal - Foundar VSRF. VSRF will conduct Promtional Programs like Contribution of DRDO & ISRO towards Nation Buliding among Educational Institutions. Research on Indian traditional Vedic knowledge for the Psychological and Physiological betterment of mankind. Implement the Vedic knowledge for the research activities in Defence, Atmospheric Science, Astronomy ,Medicine, etc. Copyright © VSRF | Powered by i-Grandee Software Technologies Pvt Ltd.